The club's main aim in life is to qualify its associates as Advanced riders and welcome them into the fold as full members. We are pleased to announce EKAM's first ordinary member to achieve the Masters award in November 2017 and, if that was not enough, he achieved a Distinction. Ray Cass joined EKAM a scant two years ago in October 2015 as a full member, taking and passing his Enhanced Advanced in March the following year. 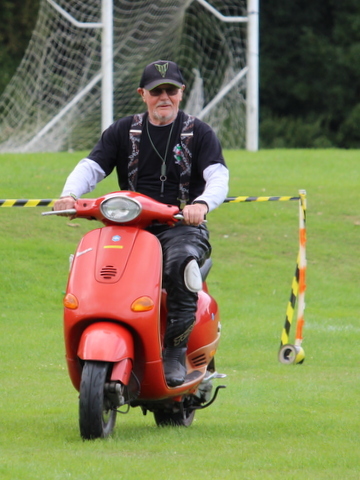 Continuing under the expert guidance of National Observer Trevor Shearsmith, Ray has achieved the most skilled level of membership possible for a civilian rider. The Observer Corps welcomes two new Local Observers at the beginning of October 2017 in the shape of Allen Webb and Derek Taylor. Both have been extensively coached by their mentors, Ian Lancefield and Nigel Wright, over the past few months and we're now looking to let them loose on some new associates while helping to maintain the high standards of road craft expected by both EKAM and IAM RoadSmart. Well done to both of them.